Boost the efficiency of your pressure cleaner with the efficacy of Hayward's new booster pump. The pump greatly increases a cleaning systems ability to propel and circulate water, providing the power needed to thoroughly clean your pool. 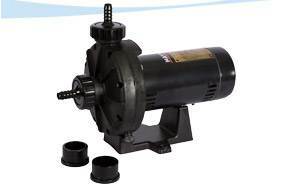 The Hayward booster pump uses up to 40% less electricity than other booster pumps and is remarkably quiet. Backed by a 1-year warranty, its sleek design and 1-1/2 unions allow for easy installation and service. Suitable for any pressure cleaner requiring a booster pump it's designed with a tall mounting base for increased motor ventilation and flood protection. An excellent replacement for any 3/4 HP pumps it's the right choice to pair with any pressure cleaner.